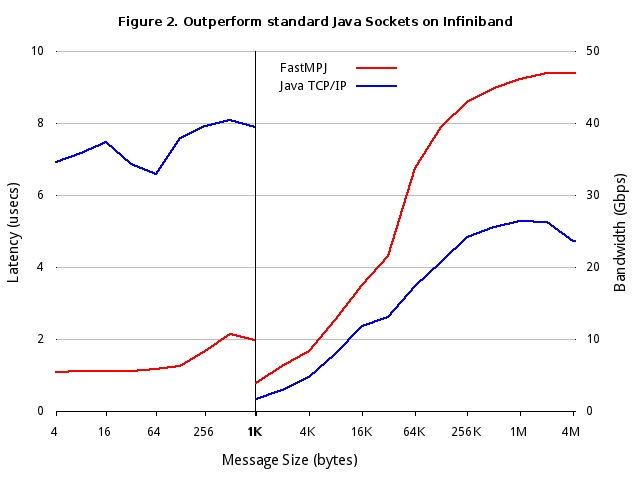 FastMPJ is an efficient Message-Passing in Java (MPJ) library for high performance support on shared memory and high-speed cluster networks (e.g., InfiniBand). 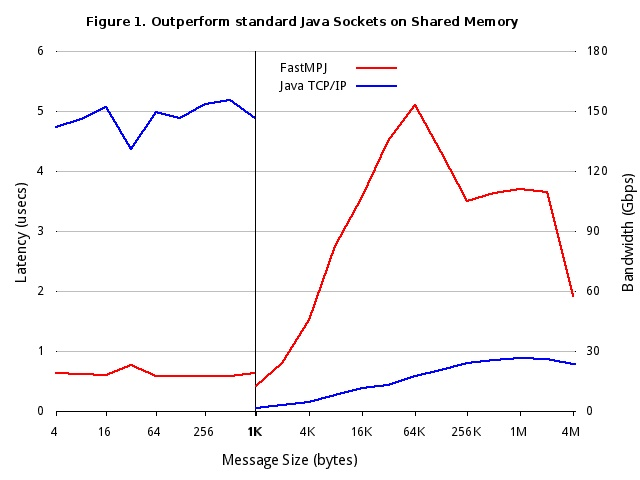 FastMPJ is fully portable, as Java, providing similar performance to native MPI libraries. Development and maintenance of FastMPJ applications is highly productive, while providing low-latency intra-node communications and efficient Remote Direct Memory Access (RDMA) transfers through zero-copy protocols. FastMPJ enables Java for high performance solutions, especially suitable for the financial sector, particularly in High Frequency Trading (HFT), as well as for High Performance Computing (HPC) and performance critical environments in particular in IT, Energy and Defense/Space. This software is commercialized and supported by Torus Software Solutions. Roberto R. Expósito, Guillermo L. Taboada, S. Ramos, Juan Touriño, R. Doallo. Low-latency Java communication devices on RDMA-enabled networks. Concurrency and Computation: Practice and Experience 27(17): 4852-4879 (2015). Roberto R. Expósito, S.Ramos, Guillermo L. Taboada, Juan Touriño, R. Doallo. FastMPJ: a scalable and efficient Java message-passing library. Cluster Computing 17(3): 1031-1050 (2014). S.Ramos, Guillermo L. Taboada, Roberto R. Expósito, Juan Touriño, R. Doallo. Design of Scalable Java Communication Middleware for Multi-Core Systems. Computer Journal 56(2): 214-228 (2013). Roberto R. Expósito, Guillermo L. Taboada, Juan Touriño, R. Doallo. Design of scalable Java message-passing communications over InfiniBand. Journal of Supercomputing 61(1): 141-165 (2012) .